I’ve got to tell you, I love Charting Companion. I’ve used it for many years now with my PAF software, although it is compatible with virtually every genealogy software program on the market, as well as Family Search. Recently, the owners updated the software to include a wonderful new feature where appropriate on reports. They map and color the X chromosome inheritance path. I did have to upgrade my Charting Companion software, but at $29.95, it certainly won’t break the bank….and it’s worth every penny. If you’re jumping up and down, doing the happy dance and hollering “WooHoooo,” I certainly understand. I did the same thing. 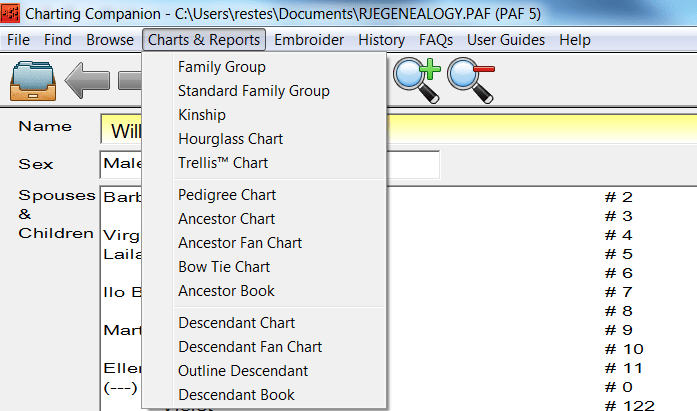 This option is available for all charts that have ancestors: Ancestor, Fan, Hourglass and Bowtie. There are several ways to select charts in this software, but the most comprehensive selection in one place is on the menu bar. Select the type of chart you want to produce. Click through the various options and select the information you want to include on your chart. When finished, click preview to be sure it’s what you want. Here are a couple examples of my reports with the X chromosome selected. I love these X reports. When you match someone on the X, you can send them one of these and they can visually see which of your lines are available for X matching. These, utilized in conjunction with the regular Charting Companion Pedigree Chart report are a powerful combinational tool. 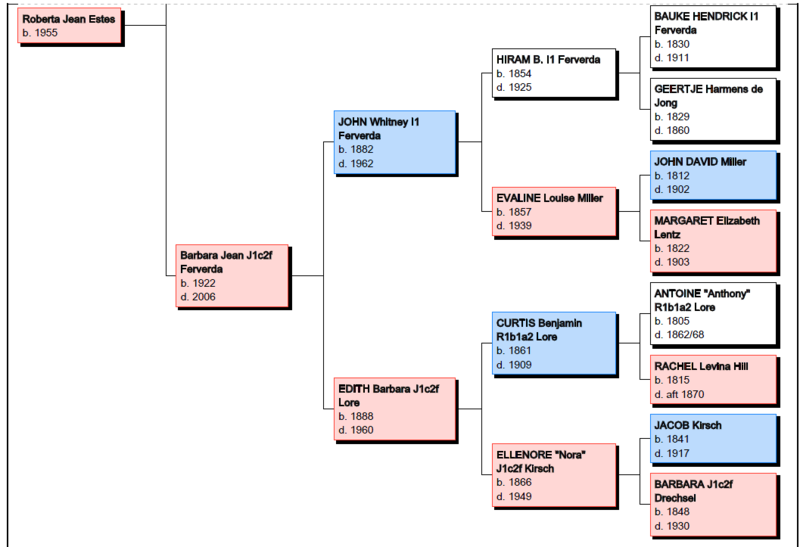 I generate a pedigree chart for each “side” of my tree, Moms and my Dad’s. Often, based on my matches, I immediately know which side the new match is from, so I only send them the relevant information. If need be, I just send both files. I’ve been a long time user of this software. I do have a tree at Ancestry but I hate to refer anyone there. Conversely, I hate receiving links to Ancestry trees. I much prefer Rootsweb/WorldConnect. 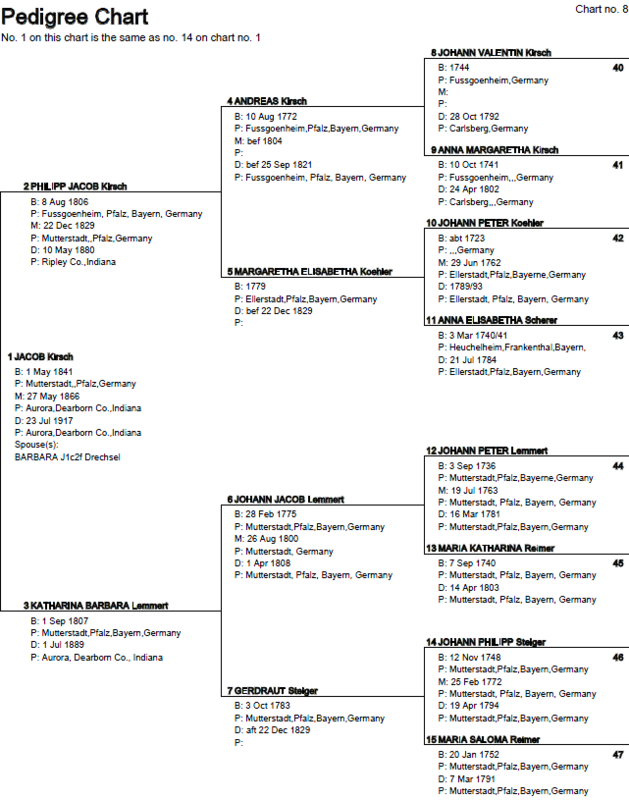 So, I send a pedigree chart of 12 generations in a pdf file with an index at the end. If you select 4 generations per page, each item will have the associated location information. 5 generations per page makes the 5th generation default to only date information, meaning they won’t be able to see locations, so don’t do that. Select the index option to add the index at the end. This makes it easy for people to skim quickly for surnames that look familiar. Lastly, when you have your selection in order, you can preview, and then the “publish” button saves this to a file on your system. Please note that if you include submitter information, it includes everything including your address and phone number in the lower left hand corner. I do not include that information in the pdf file I send to matches. I wish the software had a submitter name/e-mail only option. That’s it though, my only suggestion for this software. I love it! The questions I’ve received most often since the release of the new Family Finder Matrix from Family Tree DNA has to do with matches. Specifically, what the “In Common With” feature is telling you versus what the Family Finder “Matrix” is telling you and how to utilize all of this information together. At the bottom of this confusion is often a fundamental lack of understanding of how matching occurs and what it means in different contexts. Let’s talk about this, step by step. The “in common with” function (called triangulation for a few weeks, but now labeled “run common matches” ) shows you every person that you and one of your matches, match with in common. I’ll be running this option for my matches with cousin David, shown below. Here’s an example of my matches in common with my cousin, David. 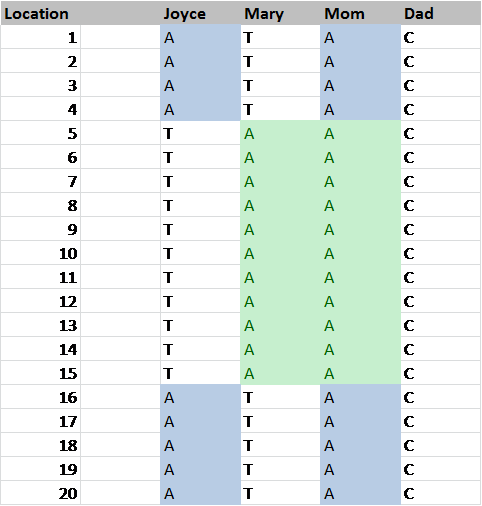 The Family Finder Matrix takes this information a bit further and shows you whether or not the people involved with this match, match each other as well. In this case, I happen to know that my cousins Harold, Carl and Dean will match each other on my father’s side, as will my cousin David. Warren doesn’t have firm genealogy, but from this, we can tell that he is indeed connected to this family group because he matches me, David, Harold and Carl, but not Dean and not Nova. We have no idea how Nova connects to this line, if she does. Notice that Nova does not match any of the other people in this group in the matrix below. That means that my and David’s common ancestor with her is likely not from this same ancestral line shared by Harold, Carl and Dean. From this point forward, I would drop back to my trusty downloaded full match spreadsheet that I maintain to see if indeed any of these people match me and my known cousins on the same segments. If so, that confirms a family/ancestor relationship. On the snipped from my spreadsheet below, you can see that Warren indeed matches both Buster and David and I, but not on the same segments. Nova didn’t match any grouping on the same segments. However, Buster and David both match me on the same portion of chromosome 19, so this confirms that we do share a common ancestor. In this case, we also know, from our genealogy that the common ancestor is Lazarus Estes and wife, Elizabeth Vannoy. Based on our multiple cousin matches, we can say that Warren is somehow connected to this line, but we can’t say how. I’ve had comments like “I have everything I need on my spreadsheet – I can see where all of my matches match me.” And indeed, you can, but it’s not everything you need. Here’s why. Without additional information, you can’t tell, by just looking at your spreadsheet whether two people who match you on the same segment are matching on your Mom or Dad’s side. For example, above, I know that both David and Buster are from my Dad’s line, but if I didn’t know that, one of them could be from Mom’s line and one could be from Dad’s, and while they are both related to me, on the same chromosome, they would, in that case, not be related to each other. So, my spreadsheet of matches tells me clearly THAT people match me, and where, but it doesn’t tell me HOW or on which side. For that, I need additional tools like ICW, the Matrix and plain old genealogy research. This is the fundamental concept of matching and in a nutshell, why it’s so difficult. There are two sides to every chromosome, Mom’s side and Dad’s side. Except nature has played a cruel trick on us and not installed a zipper. There are no Mom and Dad labels. There is no dividing that DNA or those matches in half magically, except by determing who they match, and how they do or don’t match each other. When we match ourselves against our parents, for example, we then know immediately which half of our DNA came from which parent, but if you don’t have any parents available to match against, then you have to use genealogy or cousin matches to figure that out. I talk about that in the Chromosome Mapping aka Ancestor Mapping article. I’m going to use spreadsheets as examples here. It think they are easier to see and understand, plus, I can manipulate them easily to reflect different situations. On any given chromosome, from locations 1-20, you have the following DNA, in our example. From Mom, you received all As and from Dad, all Cs. You know that because I’m telling you, but remember, the matching software doesn’t know that because there is no zipper in your DNA. All the software sees are that you have both an A and an C in location 1 and either an A or C is considered a match. In fact, this is what the software sees. Be aware that in this case, AC=CA. Now you have two cousins, Mary and Myrtle. You know, from having known them all of your life and sharing lots of Thanksgiving turkey that they are your family and you know clearly which side of your family they descend from. Both of your cousins, Mary and Myrtle match you at the same locations on this chromosome, from 5-15. But Mary is your mother’s cousin, and Myrtle is your Dad’s cousin. So even though they both match you on the same exact chromosome and the same location, they do not match each other. Well, let’s put it this way, if they also match each other, then you have an entirely different family genetic genealogy problem, called endogamy, and yes, you might be your own grandpa…but I digress. But we’re going to assume for this discussion that your mother and father are not related to each other and do not share common ancestors. Next, we have Martha. You don’t know Martha, and you don’t know how she is related, but she obviously is. Martha matches you, but she does not match Myrtle at all, and she doesn’t match Mary on enough overlapping chromosomes to be considered a match to her. You can see their common match here between Mary and Martha in location 5. 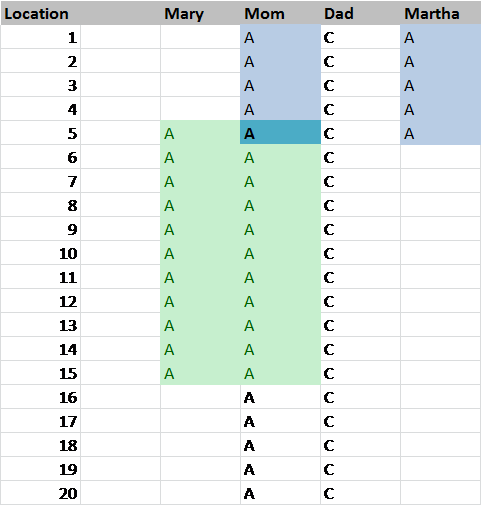 In this case, as it turns out, Martha IS a cousin to Mary on Mom’s side, but we can’t tell that from this information because they don’t match in enough common locations to be above the matching threshold. With this information, you can’t draw any conclusions. You will have to wait to see who else Martha matches and look on your spreadsheet to see if Martha matches any of your known cousins and you on common segments which would confirm a common ancestor. Your download spreadsheet will contain much more detailed information because once you match on any segment above the match threshold of about 7.7cM (plus a few other factors,) all matching segments of 1cM or above are downloaded – so you have a lot of information to work with. But using both the ICW and matrix tools, Mary might cluster with other cousins on Mom’s side which would provide us with clues as to her relationship. In fact, the first thing I’d do is to run an ICW with Mary and then utilize the Matrix tool to further define those relationships. Next we have Jeremy who is also a match to you. If you look at how Jeremy matches, you can see that he is actually matching on both sides, Mom’s and Dad’s side, but randomly. Technically, he is a match to you, because he does match one or the other of your nucleotides at each location, A or C, but without a zipper, we have no idea HOW that DNA is divided in you between Mom and Dad. In other words, the software doesn’t know that Mom was all A and Dad was all C, unless we’ve phased the data against your parents AND the software knows how to utilize that information. However, if your parents are one of your matches, you can immediately see which side the match falls on, if either. In this case, Jeremy doesn’t fall on either side because he is simply a circumstantial match, also known as a match my convergence or a false match. This is also called IBS, or identical by state, as opposed to IBD, identical by descent. The smaller the segment you show as a match, especially if there is no clustering, the more likely the match is to be IBS instead of the genealogically desirable IBD. When people ask how someone can match a child but not a parent, this is the answer. He matches you on 11 segments, circumstantially, but he only matches your parents on 5 and 6 segments, respectively, which often (but not always) puts him under the matching threshold. 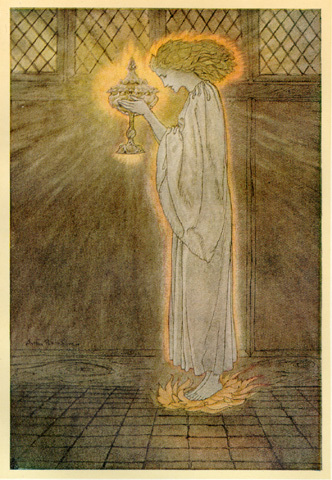 Jeremy may also match Mary, depending on the thresholds. This is also how someone can match in the “in common with” tool, but not be a match to anyone on the match list in the Matrix. In fact, this is the power of these multiple tools. This also doesn’t mean this match is entirely useless, because you DO match. It may simply not be relevant genealogically. In “The Autosomal Me” series, I’ve utilized very small match segments that in fact very probably ARE reflective of a common population and not of recent ancestry. In my Native American research, this is exactly what I was looking for. You may not be able to utilize this information today, but don’t entirely discount it either. Just set it aside and move on to a more productive match. This situation provides clues, but no proof. Mary and Joyce both match me on Mom’s segments, but they do not match each other. They don’t match me on the same segments, so this indicates that they are probably from different ancestors in my Mother’s lines. As more matches appear, the clusters of people and their genealogy will make this more apparent. In order to determine which ancestors, I’ll need to work on the genealogy of both Mary and Joyce and see who else they also match on the same segments. Sometimes the secret of the genealogy match is in the genealogy research or descent of your matches. In this example, no one matches Dad, so he’s just out for now. Susie and Mary match mom on the same segment, which proves that the three of these people share a common ancestor. Mom and Joyce match each other too, but Joyce doesn’t match Mary and Susie, so they won’t cluster together on the matrix. However, on the ICW tool, all three women, Joyce, Mary and Susie will match me and Mom. The question then becomes, are Joyce, Mary and Susie related to each other, or not. If so, and to me and Mom, then that indicates a common ancestor within the match group, like me, Joyce and Mom. The second group doesn’t match the first group – me, Mary, Mom and Susie. Using these tools together, these people clearly fall into two match groups, the green and blue on the spreadsheet below. But remember, the match routine doesn’t know which side your As and Cs came from. All it knows is that you match these people. But based on these groups and my download spreadsheet common segment matches, I can tell that I’m working with two ancestral lines. My master matching spreadsheet would now look like this. When we started, all I would have been able to see is that all of these people matched Mom and Dad and I on the same segments. By utilizing the various tools, I was able to sort into groups and eventually, subgroups. In fact, you can see below that within Mom’s pink group, there is also the smaller cluster of Mary, Susie, me and Mom. For Jeremy and Martha, we can’t do any more right now, so I’ve recorded what we do know and set them aside. 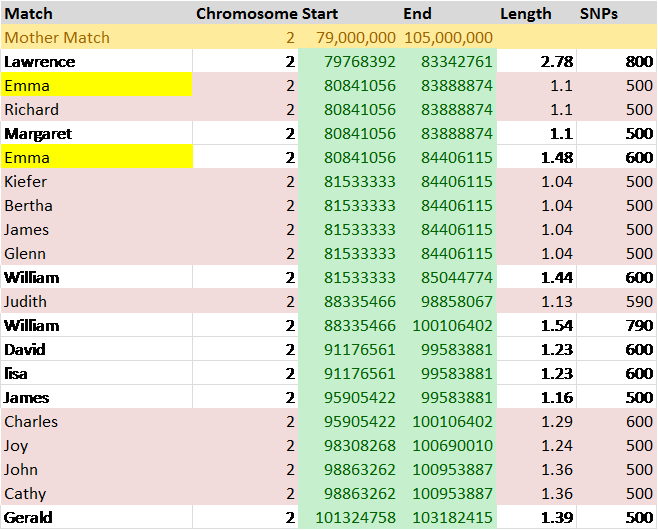 Here, you can see the matches sorted by chromosome, start and end segment. It looks a lot different than where we started, shown below, when all we had was a list of people who matched each other with no additional information. We’ve added a lot! So, where are we with this? By utilizing all of the tools at your disposal, including the ICW tool, the Family Finder Matrix, your matching spreadsheet and your genealogical information, you’re in essence creating that zipper that divides half of your DNA into Mom’s side and Dad’s side. 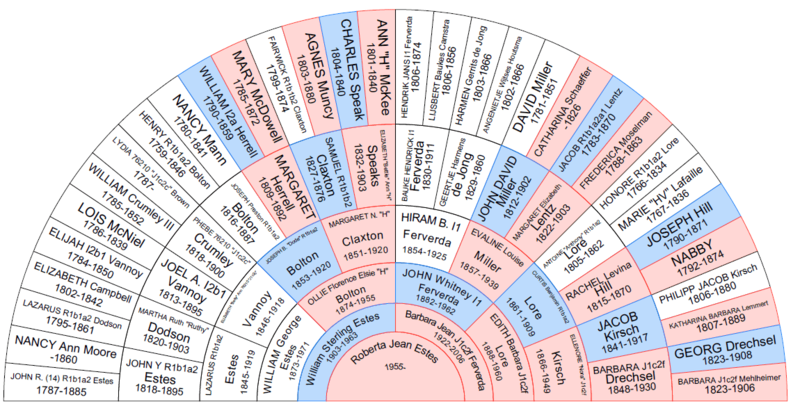 Then into grandma’s and grandpa’s side, and on up the pedigree chart. Each of these tools can tell you something unique and important. The ICW tool tells you who matches you and another person, in common. It doesn’t tell you if they also match each other. This tool can provide extremely important clustering information. For example, if I see unknown cousin Martha clustered with a whole group of known Estes descendants, then that’s a pretty good clue about how I’m related to Martha. If, on the other hand, I find Martha clustered with people from both sides of my family, well, my Mom and Dad just might be related to each other or their ancestors went to or came from the same places. By utilizing the Matrix tool, I can tell which of my matches are actually matching each other too, so that puts Martha in a much smaller group, or maybe eliminates her from certain groups. By then utilizing my downloaded match spreadsheet, on which I record every known tidbit of genealogy information, even generalities like, “family from NC” if that’s the best I can get, I can then see where Martha matches me and others on the same segments, and based on the information in the ICW and the Matrix and my genealogy info, I may be able to slot Martha into a family group. On a great day – I’ll be able to be more specific and tell her which family group – like we were able to do with my newly found cousin, Loujean. So, I hope you’ve enjoyed learning how to install a chromosome zipper. Now you can happily go about unzipping all of that genealogy information held in your DNA, that piece by piece, we’re slowing revealing. During and after the 9th Conference hosted by Family Tree DNA in Houston, TX November 8-10, several administrators collectively submitted a list of “wants and needs” that the genetic genealogy community felt could improve their experience and Family Tree DNA’s product. A small team worked diligently together afterward to refine the plans and help prioritize. Today, the fruits are already ripening on the tree. Thank you Family Tree DNA!!! During the conference, Bennett Greenspan said he was committing “whatever resources it takes,” followed by a groan (his), and the statement “I can’t believe I just said that.” Of course, all of us heard it…and Family Tree DNA is indeed coming through, very quickly. Two weeks ago there were some changes and additions, and again, today, more. I’m personally very glad to see the common matches ”crossover” link on the main screen now as well as the much requested,”download all matches,” item 6 below. Here’s a note from Bennett Greenspan about today’s six new features. Several years ago, at a DNA conference, I found myself sitting next to Peter Roberts at lunch. We discovered common ground – how can you NOT discover common ground at a genetic genealogy conference? We’ve kept in touch ever since. One of the things we discussed is the daunting task of managing multiple “stories” about the same ancestor, and now, DNA information that relates to that ancestor. Or maybe, the DNA information doesn’t relate to that ancestor, but “should.” How do we handle all of these challenges, separately or together? Peter, an archivist by trade, has a special interest in organizing records, of course, and has been working on this topic. I asked him to share his recent experience with WikiTree, and he has been gracious enough to do so. Here’s what he had to say. We know how personal computers changed the genealogy landscape by allowing us to build our own genealogy databases. The next step was the Internet which provided easier communication and convenient access to family history information. Then came DNA which allowed us to confirm if our genealogies were indeed correct. Now there is a new genetic genealogy tool, WikiTree, that puts it all together for free! Peter Roberts originally tested in 2003 and has been not-so-patiently waiting since then for one collaborative online ancestral tree where we can all hang our results. First he tried uploading a large GEDCOM in WikiTree but faced the daunting task of trying to merge his records with so many of his ancestors among the 6.1 million already in WikiTree. He opted for a manual approach and focused on DNA tested lines for himself and cousins. Fortunately, WikiTree has addressed and includes DNA testing. 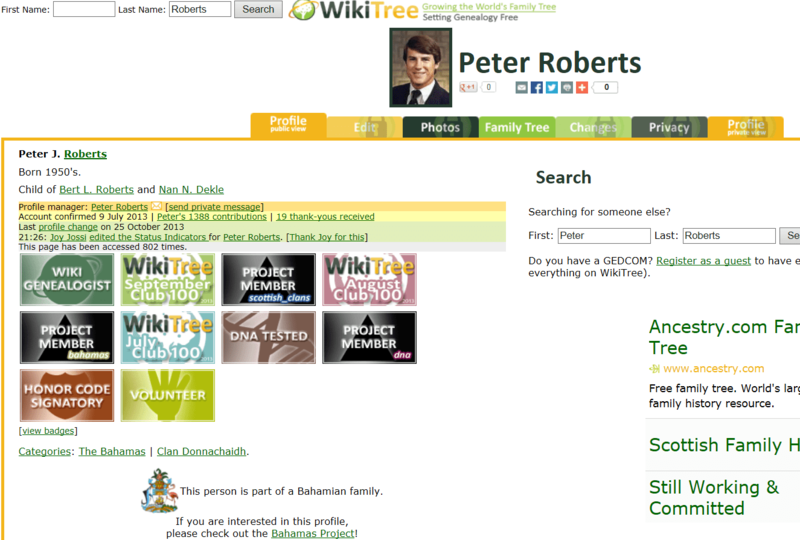 In Peter’s public profile under “DNA” WikiTree asked, “Has Peter taken a DNA test for genealogy?” Well yes! As many as he could afford. 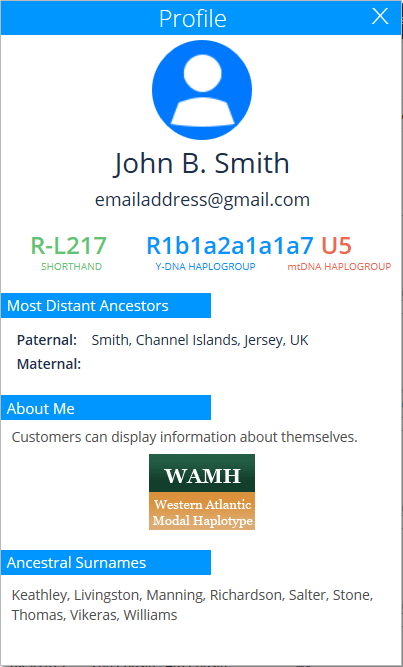 He clicked through to an “Add a New Test” page where he selected one of the Y-DNA test options from a drop down menu which generated entry fields for Haplogroup, Number of Markers, YSearch ID, and Kit Number. He did the same for his mtDNA and atDNA tests and entered his MitoSearch and GEDmatch IDs. And for good measure he added the ancestry and Y-DNA results for a distant paternal line cousin (whose test kit he manages) who he listed as “Anonymous Roberts” to protect the man’s privacy. For that easy work WikiTree awarded each test taker a handsome DNA Tested badge which can be displayed on the tester’s public profile. Like magic (but it actually took about 24 hours) in the public profiles of Peter’s direct line ancestors, WikiTree automatically provided links to corresponding results in YSearch and MitoSearch. And cousin Anonymous was there also. 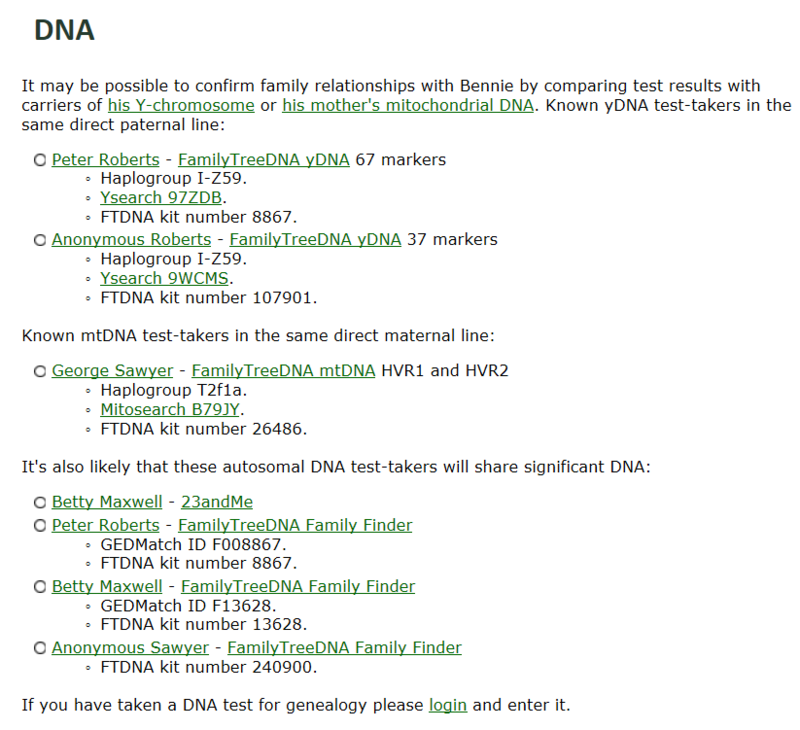 Here’s the screen shot from WikiTree regarding DNA testing relevant to this ancestor, Bennie Roberts. Now anyone can see Peter’s DNA test list and compare his results with those of his direct line cousins to determine if their DNA is a close enough match. If not, then the mis-matching DNA is pointing out a problem in that direct line. Peter’s crotchety cousin Rufus refuses to DNA test and his WikiTree profile notes by default “…there are no known yDNA or mtDNA test-takers in the same direct paternal or maternal line.” It’s a reminder that perhaps someday Rufus’ son will do that honor. 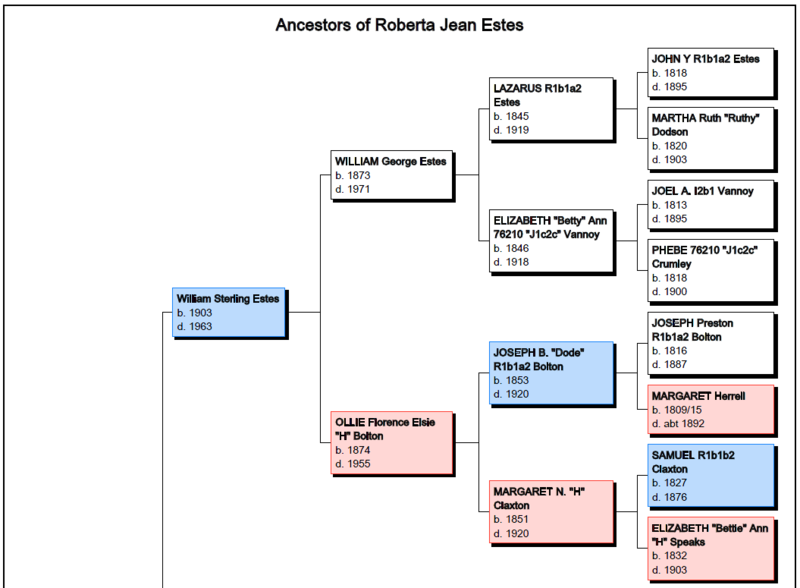 The profile of Peter’s paternal grandfather, Bennie Roberts, http://www.wikitree.com/wiki/Roberts-7102 illustrates many beneficial features. Under the DNA heading are the known Y-DNA testers in WikiTree who share his direct paternal line and the mtDNA tester who shares his direct maternal line. These names link to their public WikiTree profiles. Here is Peter’s page via the “person who DNA tested” link on his grandfather’s page. Please note that while WikiTree is “free,” there is no such thing as a “free lunch” so Ancestry ads are plastered all over every page in strategically placed locations. Peter has no control over this, and neither will you. To the right of the tester’s name is the testing company and the type of test (Y-DNA or mtDNA). This links to a more descriptive Test Connections overview page. A key feature on these test connections pages is the earliest known direct line ancestor is highlighted and followed by a link to a descendant chart of carriers of the type of DNA tested (Y-DNA http://www.wikitree.com/treewidget/Roberts-7104/890 or mtDNA http://www.wikitree.com/treewidget/Unknown-205578/890). Unlike many other online genealogy databases, these charts have a web addresses (urls) which facilitates sharing. Peter is now joyously (joyfully?) decorating his ancestral tree with haplogroup ornaments and haplotype garlands as well as project badges. His tree is growing in an aspen forest and there is something special about aspen forests. Aside from the obvious “tree” challenges, in terms of results that might not match the expected line and are not part, genetically, of the aspen forest, there are also other challenges to be addressed. Over time, the naming of haplogroups has become confusing. This is because haplogroups are defined by SNPs that are given names like M-269. M-269 happens to define haplogroup R1b1a2, which used to be R1b1c. Genealogists have tried to fit the SNPs into a tree-like structure, shown above (tree compliments of Family Tree DNA) because we understand trees and haplogroups are like trees (trunk, branches, leaves) – but the problem occurred when newly discovered branches needed to be inserted in-between already existing branches that already had names. Every downstream branch’s name shifted, for example, from R1b1c to R1b1a2, and confusion resulted. Today, we are moving away from haplogroup names like R1b1a2 and using only the SNP name, M269, which will never change. Of course, the problem with this is that the name doesn’t give you any idea of where the SNP falls on the tree, where the old nomenclature did – R1b1a2 was downstream from R1b1a which was downstream from R1b1, etc. When entering information into WikiTree, Y chromosome (Y-DNA) haplogroups should be labeled with the first letter of the major haplogroup branch followed by a dash and the name of the final (downstream or most recent) SNP. For example: R-M269 which is the SNP for R1b1a2. 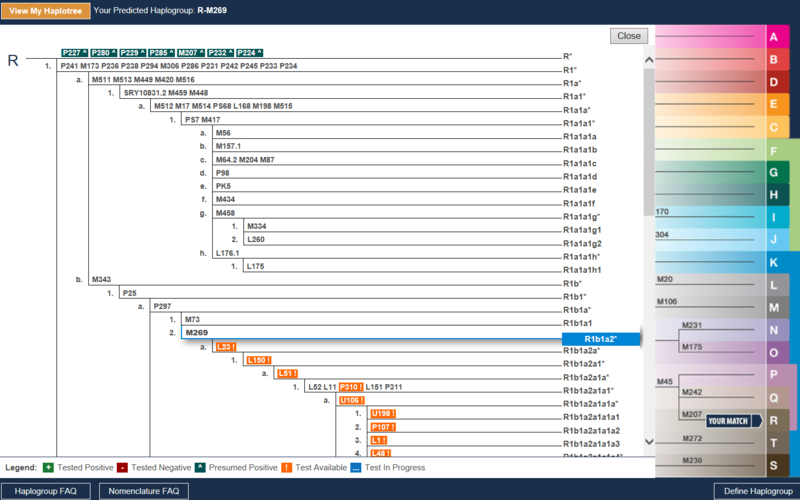 Because separate labs have reported different labels over time for haplogroups and their subclades, and because there is no verification process for how haplogroups are entered in WikiTree, there will be inconsistencies in haplogroup labeling. So in the note field it is important to explain how you came up with that haplogroup (eg. Estimated haplogroup R-CTS241, aka R1b1a2a1a2c1 per ISOGG Y-DNA Haplogroup Tree, 17 Jul 2013). Also, remember to update your information at WikiTree if you take more DNA tests or upgrade. The source and the date for the Mitochondrial (mtDNA) haplogroups should be entered as reported by the genetic genealogy testing lab, along with which lab did the testing. An example is: L3f. If you have additional knowledge of your more precise subclade (e.g. from full sequence results) then use the more precise haplogroup label. Peter notes that more features are revealed once you are a registered WikiTree user. Thanks much to Peter Roberts for sharing with us. Think you might be related or have questions? You can contact Peter directly at peterebay@yahoo.com. Sangreal – the Holy Grail. We are finally here, Part 9 and the final article in our series. The entire purpose of The Autosomal Me series has been to use our DNA and the clues it holds to identify minority admixture, in this case, Native American, and by identifying those Native segments, and building chromosomal clusters, to identify the family lines that contributed that Native admixture. Articles 1-8 in the series set the stage, explained the process and walked us through the preparatory steps. In this last article, we apply all of the ingredients, fasten the lid, shake and see what we come up with. Let’s take a minute and look at the steps that got us to this point. Part 3, “The Autosomal Me – Who Am I?,” reviewed using our pedigree charts to gauge expected results and how autosomal results are put into population buckets. Part 4, “The Autosomal Me – Testing Company Results,” shows what to expect from all of the major testing companies, past and present, along with Dr. Doug McDonald’s analysis. 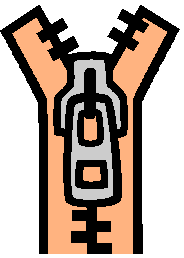 In Part 5, “The Autosomal Me – Rooting Around in the Weeds Using Third Party Tools,” we looked at 5 different third party tools and what they can tell us about our minority admixture that is not reported by the major testing companies because the segments are too small and fragmented. In Part 6, “The Autosomal Me – DNA Analysis – Splitting Up” we began the analysis part of the data we’ve been gathering. We looked at how to determine whether minority admixture on specific chromosomes came from which parent. 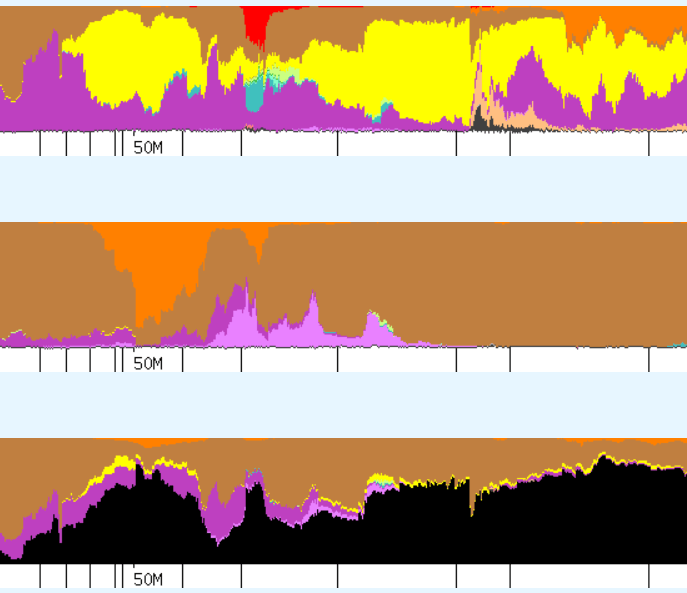 Part 7, “The Autosomal Me – Start, Stop, Go – Identifying Native Chromosomal Segments” took a deeper dive and focused on the two chromosomes with proven Native heritage and began by comparing those chromosome segments using the 4 GedMatch admixture tools. Part 8, “The Autosomal Me – Extracting Data Segments and Clustering,” we extract all of the Native and Blended Asian segments in all 22 chromosomes, but only used chromosomes 1 and 2 for illustration purposes. We then clustered the resulting data to look for trends, grouping clusters by either the Strong Native criteria or the Blended Asian criteria. In this final segment, Part 9, we will be applying the chromosomal information we’ve gathered to our matches and determine which of our lines are the most likely to have Native Ancestry. This, of course, has been the goal all along. So, drum roll…..here we go. 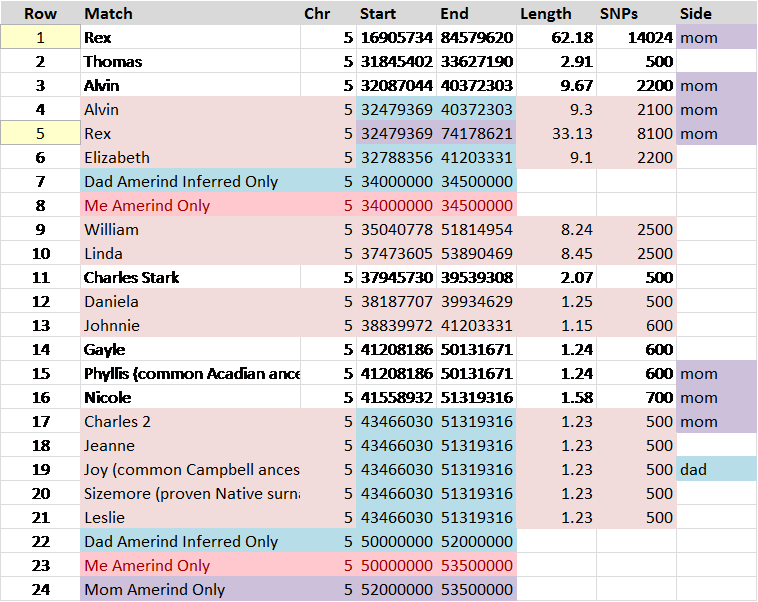 In Part 8, we ended by entering the start and stop locations of both Strong Native and Blended Asian clusters into a table to facilitate easy data entry into the chromosome match spreadsheet downloaded from either 23andMe or Family Tree DNA. If you downloaded it previously, you might want to download it again if you haven’t modified it, or download new matches since you last downloaded the spreadsheet and add them to the master copy. My goal is to determine which matches and clusters indicate Native ancestry, and how to correlate those matches to lineage. In other words, which family lines in my family were Native or carry Native heritage someplace. The good news is that my mother’s line has proven Native heritage, so we can use her line as proof of concept. My father’s family has so many unidentified wives, marginalized families and family secrets that the Native line could be almost any of them, or all of them! Let’s see how that tree shakes out. So let’s look at a quick example of how this would work. Let’s say I have a match, John, on chromosome 4 in an area where my mother has no Native admixture, but I do. Therefore, since John does not match my mother, then the match came from my father and if we can identify other people who also match both John and I in that same region on that chromosome, they too have Native ancestry. Let’s say that we all also share a common ancestor. It stands to reason at that point, that the common ancestor between us indicates the Native line, because we all match on the Native segment and have the same ancestor. Obviously, this would help immensely in identifying Native families and at least giving pointers in which direction to look. This is a “best case’ example. Some situations, especially where both parents contribute Native heritage to the same chromosome, won’t be this straightforward. Based on our findings, the maximum range and minimum (least common denominator or “In Common” range is as follows for the strongest Native segments on chromosomes 1 and 2. At GedMatch, I used a comparison tool to see who matched me on chromosome 1. Only 2 people outside of immediate family members matched, and both from Family Tree DNA. Both matched me on the critical Native segments between about 165-180mg. I was excited. I went to Family Tree DNA and checked to see if these two people also matched my mother, which would confirm the Native connection, but neither did, indicating of course that these two people matched me on my father’s side. That too is valuable information, but it didn’t help identify any common Native heritage with my mother on chromosome 1. It did, however, eliminate them as possibilities which is valuable information as well. I used a new tool, DNAGedcom, compliments of Rob Warthen who has created a website, DNA Tools, at www.dnagedcom.com. This wonderful tool allows you to download all of your autosomal matches at Family Tree DNA and 23andMe along with their chromosomal segment matches. Since my mother’s DNA has only been tested at Family Tree DNA, I’m limiting the download to those results for now, because what I need is to find the people who match both she and I on the critical segments of chromosome 1 or 2. It was disappointing to discover that my mother and I had no common matches that fell into this range on chromosome 1, but chromosome 2 was another matter. Please note that I have redacted match surnames for privacy. 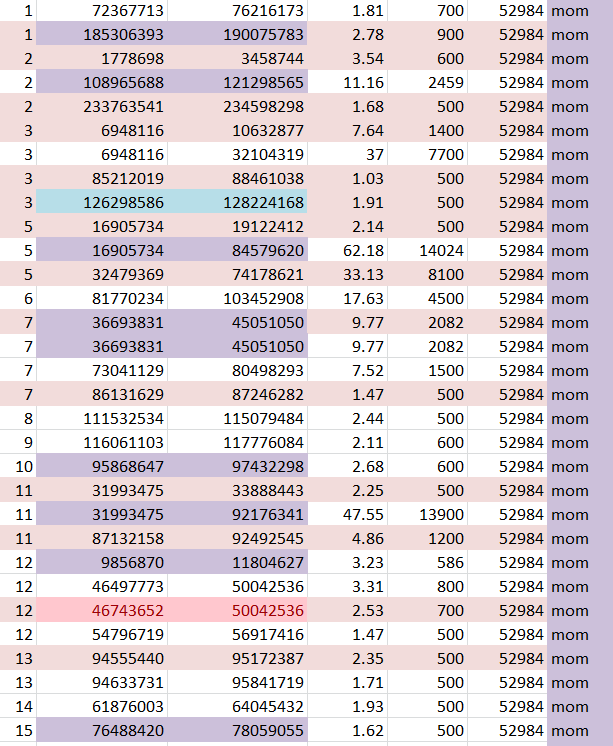 The spreadsheet above shows the comparison of my matches (pink) and Mother’s (white). The Native segment of chromosome 2 where I match Mother is shaded mustard. I shaded the chromosome segments that fell into the “common match” range in green. Of those matches, there is only one person who matches both Mother and I, Emma. The next step, of course, is to contact Emma and see if we can discover our common ancestor, because whoever it is, that is the Native line. As you might imagine, I am chomping at the bit. There are no segments of chromosome 2 that are unquestionably isolated to my father’s line. Are you wondering about now how something that started out looking so simple got so complex? Well, I am too, you’re not alone. But we’ve come this far, so let’s go that final leg in this journey. My mom always used to say there was no point in doing something at all if you weren’t going to do it right. Sigh….OK Mom. The easiest way to facilitate a chromosome by chromosome comparison with all of your matches and your Strong Native and Blended Asian segments is to enter all of these segment groups into the match spreadsheet. If you’re groaning and your eyes glaze over right after you do one big ole eye roll, I understand. But let’s take a look at how this helps us. On the excerpt from my spreadsheet below, for a segment of chromosome 5, I have labeled the people and how they match to me. The ones labeled “Mom” in the last column are labeled that way because these people match both Mom and I. The ones labeled “Dad” are labeled that way because I know that person is related on my father’s side. 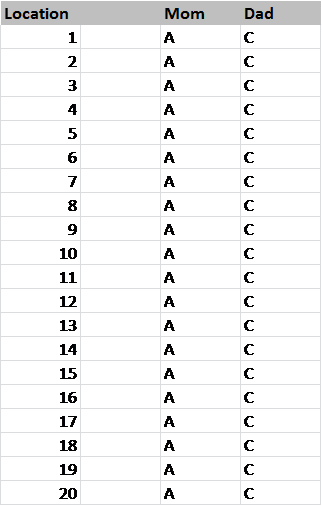 Using the information from the tables created in Step 8, I entered the beginning and end of all matching segment clusters into my spreadsheet. You can see these entries on lines 7, 8, 22, 23 and 24. You then proceed to colorize your matches based on the entry for either Mom or Dad – in other words the blue row or the purple row, line 7, 22 or 24. In this example, actually, line 5 Rex, based on the coloration, should have been half blue and half purple, but we’ll discuss his case in a minute. The you can then sort either by match name or by chromosome to view data in both ways. Let’s look at an example of how this works. White Rows: Mother’s matches. When Mother and I both match an individual, you’ll see the same matches for me in pink. This double match indicates that the match is to Mother’s side and not Father’s side. Purple “Mom” labels in last column: The individual matches both me and Mom. This is a genetic match. Teal “Dad” labels in last column: Genealogically proven to be from my father’s side. This is a genealogical, not a genetic label, since I don’t have Dad’s DNA and can only infer these genetically when they don’t also match Mother. Dark Pink Rows labeled “Me Amerind Only” are Strong Native or Blended Asian segments from Chromosome Table that I have entered. My segments must come from one of my parents, so I’ve either colored them purple, if the match is someone who matches Mother and I both, or teal, if they don’t match both Mom and I, so by inference they come from my father’s line. Dark Purple Rows labeled “Mom Amerind Only” are Mom’s segments from the Chromosome Table. Dark Teal Rows labeled “Dad Amerind Only” are inferred segments belonging to my father based on the fact that Mother and I don’t share them. This is a good place to talk for just a minute about inferred relationships in this context. Inference gets somewhat tenuous or weak. 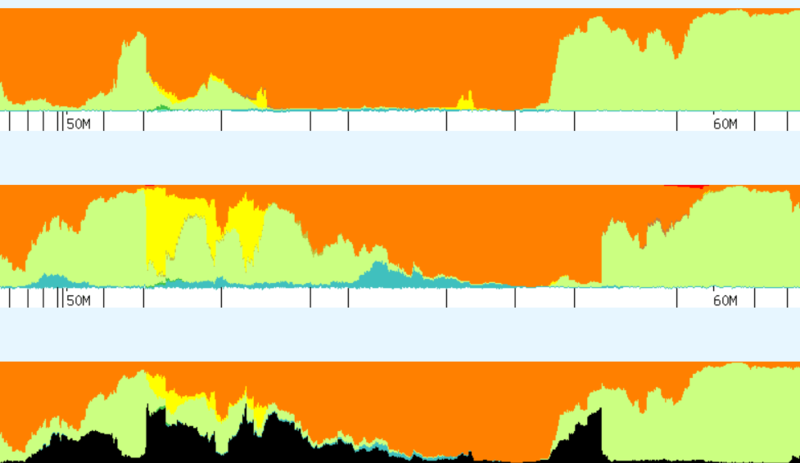 The inferred matches on my father’s side began with the Native segments in the admix tools. Some inferences are very strong, where Mother has no Native at all in that region. For example, Mom has European and I have Native American. No question, this had to come from my father. But other cases are much less straightforward. In many cases, categorization may be the issue. Mom has West Asian for example and I have Siberian or Beringian. Is this a categorization issue or is this a real genetic difference, meaning that my Siberian/Beringian is actually Native and came from my father’s side? Other cases of confusion arise from segment misreads, etc. I’ve actually intentionally included a situation like this below, so we can discuss it. Like all things, some amount of common sense has to enter the picture, and known relationships will also weigh heavily in the equation. 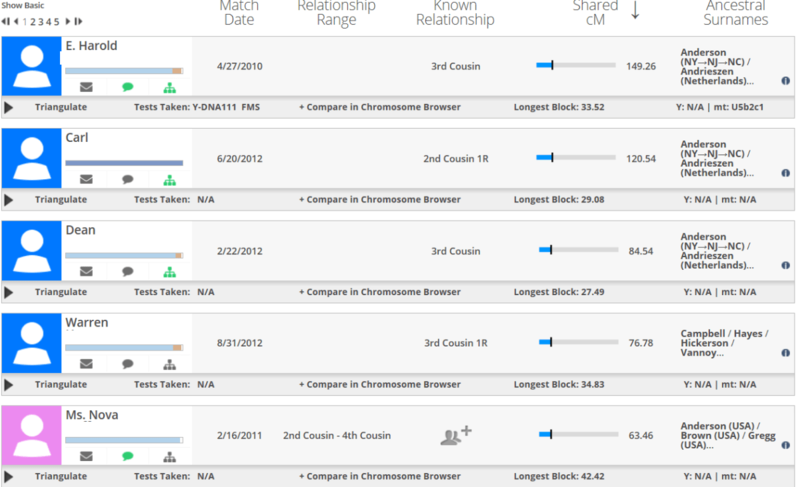 How known family members match on other chromosome segments is important too. Do you see a pattern or is this match a one-time occurrence? Patterns are important. Keep in mind that these entries only reflect STRONG Asian or Native signals, not all signals. So even if Mother doesn’t have a strong signal, it doesn’t mean that she doesn’t have ANY signal in that region. In some cases, start and stop segments for Mom and Dad overlapped due to very long segments on some matches. In this case, we have to rely on the fact that we do have Mother’s actual DNA and assume that if they aren’t also a match to Mother, that what we are seeing is actually Dad’s lines, although this may not in actuality always be true. Why? Because we are dealing with segments below the matching threshold limit at both Family Tree DNA and 23andMe, and both of my parents carry Native heritage. We can also have crossed a transitional boundary where the DNA that is being matched switches from Mom’s side to Dad’s side. Ugh, you say, now that’s getting messy. Yes, it is, and it has complicated this process immensely. Taking a look at this portion of chromosome 5, we have lots going on in this cluster. Most segments will just be boring pink and white (meaning no Native), but this segment is very busy. Mom and I match on a small segment from 52,000,000 to 53,000,000. Indeed, this is a very short segment when compared to the entire chromosome, but it is strongly Native. We both also match Rex, our known cousin. I’ve noted him with yellow in the table. Please note that Mom’s white matches are never shaded. I am focused on determining where my own segments originate, so coloring Mother’s too was only confusing. Yes, I did try it. You can see that Mother actually shares all or any part of her segment with only me and Rex. This simplifies matters, actually. However, also note that I carry a larger segment in this region than does Mother, so either we have a categorization issue, a misread, or my father also contributed. So, a conundrum. This very probably implies that my father also carried Native DNA in this region. Let’s see what Rex’s DNA looks like on this same segment of chromosome 5, from 52-53 using Eurogenes. In the graph below, my chromosome is the top bar, Rex’s the middle and the bottom bar shows common DNA with the black nonmatching. Yellow is Native American, red is South Asian, putty is Siberian, lime green is Mediterranean, teal is North Europe, orange is Caucus. This same comparison is shown to Mother’s DNA (top row) below. It’s interesting that while Mother doesn’t have a lot of yellow (Native), she does have it throughout the same segment where Rex’s occurs, from about 52 through 53.5. Does this actually point to a Native ancestor in the common line between Rex, Mom and I, which is the Swiss/German Johann Michael Miller line which does include an unidentified wife stateside, or does this simply indicate a common ancient population long ago in Asia? It’s hard to say and is deserving of more research. I feel that it is most likely Native because of the actual yellow, Native segment. If this was an Asian/European artifact, it would be much less likely to carry the actual yellow segment. Is Rex also genealogically related to my father? As I’ve worked through this process with all of my chromosomes and matches, I’ve really come to question if one of my father’s dead ends is also an ancestral line of my mother’s. The key to making sense of these results is clusters. The work we’ve already done, especially in Step 8, clusters the actual DNA matching segments. We’ve now entered that information into the spreadsheet and colored the segments of those who match. What’s next? The key is to look for people with clusters. Many matches will have one segment, of say, 10 that match, colored. Unless this is part of a large chromosome cluster, it’s probably simply an outlier. Part of a large chromosome cluster would be like the large Strong Native segments on chromosome 1 or 2, for example. How do we tell if this is a valid match or just an outlier? Sort the spreadsheet by match name. Take a look at all of the segments. The example we’ll use is that of my cousin, Rex. If you recall, he matches both me and Mother, is a known first cousin twice removed to me, (genetically equal to a second cousin), and is descended from the Miller line. In this example, I also colored Mother’s segments because I wanted to see which segments that I did not receive from her were also Native. You can see that there are many segments where we all match and several of those are Native. These also match to other Miller descendants as well, so are strongly indicative of a Native connection someplace in our common line. If we were only to see one Native segment, we would simply disregard this as an outlier situation. But that’s not the case. We see a cluster of matches on various segments, we match other cousins from the same line on these segments, and reverting back to the original comparison admixture tools verifies these matches are Native for Rex, Mom and me. Hmmmm…..what is Dad’s blue segment color doing in there? Remember I said that we are only dealing with strong match segments? Well, Mom didn’t have a strong segment at that location and so we inferred that Dad did. But we know positively that this match does come from Mother’s side. I also mentioned that I’ve come to wonder if my Mom and Dad share a common line. It’s the Miller line that’s in question. One of Johann Michael Miller’s children, Lodowick, moved from Pennsylvania to Augusta County, Virginia in the 1700s and his line became Appalachian, winding up in many of the same counties as my father’s family. I’m going to treat this as simply an anomaly for now, but it actually could be, in this case, an small indication that these lines might be related. It also might be a weak “Mom” match, or irrelevant. I see other “double entries” like this in other Miller cousins as well. What is the pink row on chromosome 12? When I grouped the Strong Native and Asian Clusters, sometimes I had a strong grouping, and Mom had some. The way I determined Dad’s inferred share was to subtract what Mom had in those segments from mine. In a few cases, Mom didn’t have enough segments to be considered a cluster but she had enough to prevent Dad from being considered a cluster either, so those are simply pink, me with no segment coloring for Mom or Dad. This meets the criteria for 8 of 15 ethno-geographic locations (in the admix tools) within a 2.5 cM distance of each other, so this cluster would be included in the Mixed Asian for me. It could also be a Strong Native cluster if it was found in 3 of 4 individual tools. Regardless of how, it has been included. Let’s now say that Mom carries Native/Mixed Asian at 10, 12 and 14, but not elsewhere in this cluster. Mom’s 3 does not qualify her for the 8/15 and it only leaves Dad with 5 inferred segments, which disqualifies him too. So in this case, my cluster would be listed, but not attributable directly to either parent. What this really says is that both of my parents carry some Native/Blended Asian on this segment and we have to use other tools to extrapolate anything further. The logic steps are the same as for Dad’s blue segment. We’re going to treat that as an outlier. If I really need to know, I can go back to the actual admixture tools and see whether Mom or Dad really match me strongly on which segments and how we compare to Rex as well. In this case, it’s obvious that this is a match to my Mother’s side, so I’m leaving well enough alone. Let’s see what the matches reveal. 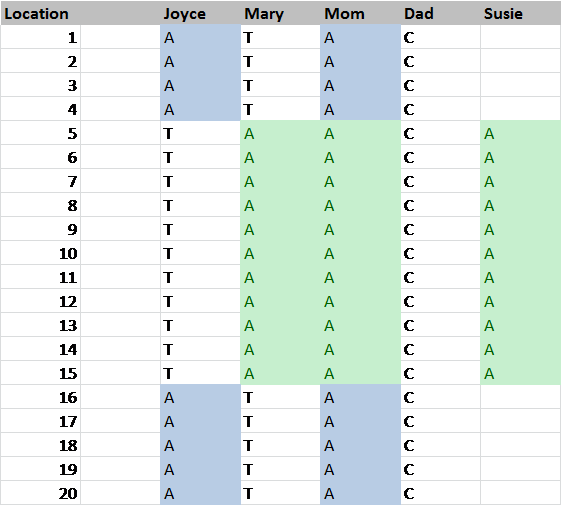 Referring back to the Nitty Gritty Data spreadsheet, Mom’s match to Phyllis on row 15 confirms an Acadian line. This is the known line of Mother’s Native ancestry. This makes sense and they match on Native segments on several other chromosomes as well. In fact, many of my and Mother’s matches have Acadian ancestry. My match to row 19, Joy, is a known cousin on my father’s side with common Campbell ancestry. This line is short however, because our common ancestor, believed to be Charles Campbell died before 1825 in Hawkins County, TN. He was probably born before 1750, given that his sons were born about 1770 and 1772. Joy and I descend from those 2 sons. Charles wife and parents are unknown, as is his wife. My match to row 20, inferred through my father’s side, is to a Sizemore, a line with genetically proven Native ancestry. Of course, this needs more research, but it may be a large hint. I also match with several other people who carry Sizemore ancestors. This line appears to have originated near the NC/VA border. I wanted to mention rows 4 and 17. Using our rules for the spreadsheet, if I match someone and they don’t also match Mother on this segment, I have inferred them to be through my father. These are two instances that this is probably incorrect. I do match these people through Mother, but Mother didn’t carry a strong signal on this segment, so it automatically became inferred to Dad. Remember, I’m only recording the Strong Native or the Blended Asian segments, not all segments. However, I left the inferred teal so that you can see what kinds of judgment calls you’ll have to make. This also illustrates that while Mom’s genetic matches are solid, Dad’s inferred matches are less so and sometimes require interpretation. The proper thing to do in this instance would be to refer back to the original admixture tools themselves for clarification. Let’s see what that shows. Using HarrappaWorld, the most pronounced segment is at about 52. Teal is American. You can see that Mother has only a very small trace between 53 and 54, almost negligible. Mother’s admixture at location 52 is two segments of purple, brown and cinnamon which translate to Southwest Asian (lt purple), Mediterranean (dk purple), Caucasian (brown) and Balock (cinnamon), from Pakistan. Checking Dodecad shows pretty much the same thing, except Mother’s background there is South Asian, which could be the same thing as Caucus and Pakistan, just different categorizations. In this case, it looks like the admixture is not a categorization issue, but likely did come from my father. Each segment will really be a case by case call, with only the strongest segments across all tools being the most reliable. It’s times like this that we have to remember that we have two halves of each chromosome and they carry vastly different information from each of our parents. Determining which is which is not always easy. If in doubt, disregard that segment. So, what, really did I figure out after all of this? I was working with a total of 292 people who had at least one chromosomal segment that matched me with a Strong Native or Blended Asian segment. Of those, 59 also matched Mom’s DNA. Of those, 18 had segments that matched only Mom. This means that some of them had segments that also matched my father. Keep in mind, again, that we are only using “strong matches” which involves inferring Dad’s segments and that referring back to the original tools can always clarify the situation. There seems to be some specific areas that are hotspots for Native ancestry where it appears that both of my parents passed Native ancestry to me. Many of my and my mother’s 59 matches have Acadian ancestry which is not surprising as the Acadians intermarried heavily with the Native population as well as within their own ethnic group. Several also have Miller Ancestry. My Miller ancestor is Johann Michael Miller (1692-1771) who immigrated in the colonial period and settled on the Pennsylvania frontier. His son, Philip Jacob Miller’s (1726-1799) wife was a woman named Magdalena whose last name has been rumored for years to be Rochette, but no trace of a Rochette family has ever been found in the county where they lived, region or Brethren church history…and it’s not for lack of looking. Several matches point to Native Ancestry in this line. This also begs the question of whether this is really Native or whether it is really the Asian heritage of the German people. Further analysis, referring back to the admixture tools, suggests that this is actually Native. It’s also interesting that absolutely none of Mother’s other German or Dutch lines show this type of ancestry. There is no suggestion of Native ancestry in any of her other lines. Mother’s results are relatively clean. Dad’s are anything but. My father’s side of the family, however, is another story. I have 233 matches that don’t also match my mother. There can be some technical issues related to no-calls and such, but by and large, those would not represent many. So we need to accept that most of my matches are from my Father’s side originating in colonial America. This line is much “messier” than my mother’s, genealogically speaking. Of those 233 matches, only 25 can be definitely assigned to my father. By definitely assigned, I mean the people are my cousins or there is an absolutely solid genealogical match, not a distant match. Why am I not counting distant matches in this total? We all know by virtue of the AncestryDNA saga that just because we match family lines and DNA does NOT mean that the DNA match is the genealogical line we think it is. If you would like to read all about this, please refer to the details in CeCe Moore’s blog where she discussed this phenomenon. The relevant discussion begins just after the third photo in this article where she shows that 3 of 10 matches at Ancestry where they “identify” the common DNA ancestor are incorrect. Of course, they never SAY that the common ancestor is the DNA match, but it’s surely inferred by the DNA match and the “leaf” connecting these 2 people to a common ancestor. It’s only evident to someone who has tested at least one parent and is savvy enough to realize that the individual whose ancestor on Mom’s side that they have highlighted, isn’t a match to Mom too. Oops. Mega-oops!!! However, because we are dealing in our project, on Dad’s side, with inferences, we’re treading on some of the same ground. Also, because we are dealing with only “strong clustered” segments, not all Native or Asian segments and because it appears that my parents both have Native ancestry. To make matters worse, they may both have Algonquian, Iroquoian or both. I have also discovered during this process that several of my matches are actually related to both of my parents. I told you this got complex. Of the people who don’t match Mother, 32 of them have chromosomal matches only to my father, so those would be considered reliable matches, as would the closest ones of the 25 that can be identified genealogically as matching Dad. Many of these 25 are cousins I specifically asked to test, and those people’s results have been indispensable in this process. In fact, it’s through my close circle of cousins that we have been able to eliminate several lines as having Native ancestry, because it doesn’t’ show as strong and they don’t have it either. 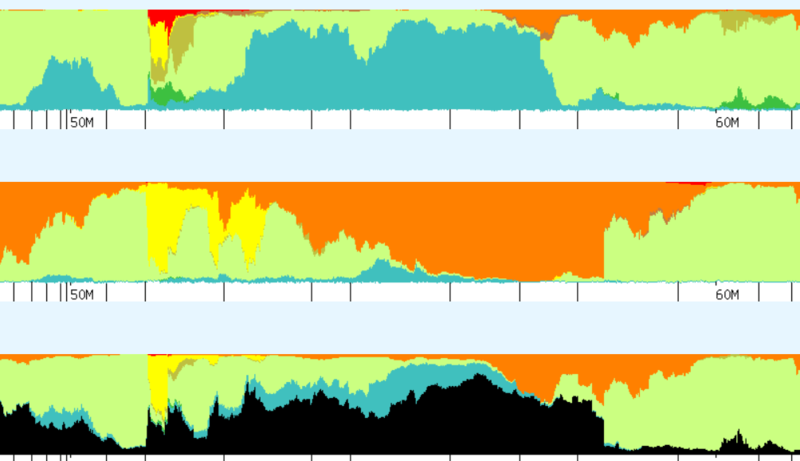 Many of these lines group together when looking at a specific chromosome. There is line after line and cousin after cousin with highlighted data. So what has this told me? This information strongly suggests that the following lines on my father’s side carry Native heritage. Note the word “carry.” All we can say at this point is that it’s in the soup – and we can utilize current matches at our testing company and at GedMatch, genealogy research and future matches to further narrow the branches of the tree. Many of these families are intermarried and I have tried to group them by marriage group. Obviously, eventually, their descendants all intermarried because they are all my ancestors on my father’s side. But multiple matches to other people who carry the Native markers but aren’t related to my other lines are what define these as lines carrying Native heritage someplace. Claxton/Clarkson – Russell Co., Va, Claiborne and Hancock Co., Tn – In NC associated with the known Native Hatcher family. Possibly a son-in-law. Missing family entirely. While this looks like a long list, the list of families that don’t have any Native ancestry represented is much longer and effectively serves to eliminate all of those lines. While I don’t have “THE” answer, I certainly know where to focus my research. Maybe there isn’t the one answer. Maybe there are multiple answers, in multiple lines. Is this complex? Yes! Is it a lot of work? You bet it is! Is everything cast in concrete? Never! You can see that by the differences we’ve found in data interpretation, not to mention issues like no-calls (areas that for some reason in the test don’t read) and cross overs where your inheritance switches from your mom’s side to your dad’s side. Is there any other way to do this? No, not if your minority admixture is down in that weedy area around 1%. Is it worth it? You’ll have to decide. It guess it depends on how desperately you want to know. Part of the reason this is difficult is because we are missing tools in critical locations. It’s an intensively laborious manual process. In essence, using various tools, one has to figure out the locations of the Native and Asian chromosome segments and then use that information to infer Native matches by a double match (genetic match at DNA company plus match with Strong Native/Blended Asian segment) with the right parent. It becomes even more complex if neither parent is available for testing, but it is doable although I would think the reliability could drop dramatically. Matches at testing companies come and go….and sometimes just go. At Family Tree DNA, I have some matches that must be trembling on the threshold that come and go periodically. Now you see them, now you don’t. I lost matches moving from the Affy chip to the Illumina chip and lost additional matches between Build 36 and 37. Some reappeared, some haven’t. The centromere locations change between builds. If you have matches near or crossing the middle of the chromosome, called the centromere, there may be breaks in that region. I enter the centromere start and stop locations in my spreadsheet so that if I notice something odd going on in that region, the centromere addresses are right there to alert me that I’m dealing with that “odd” region. You can find the centromere addresses in the FAQ at Family Tree DNA for their current build. At 23andMe, when you reach the magic 1000 matches threshold, you start losing matches and the matching criteria is elevated so that you can stay under 1000 matches. For people with colonial American or Jewish heritage, in other words those with high numbers of matches, this is a problem. Watch for matches that are related to both sides of your family. If your family lived in colonial America, you’re going to have a lot of matches and many are probably related to each other in ways you aren’t aware of. If your parents are related to each other, this process might simply be too complex and intertwined to provide enough granular data to be useful. If you’re going to follow this procedure, save one spreadsheet copy with the Strong Native only and then a second one with both the Strong Native and Blended Asian. I’m undecided truthfully whether the Mixed Asian adds enough resolution for the extra work it generates. When in question, refer back to the original tools. The answer will always be found there. Unfortunately, tools change. You may want to take screen shots. During this process, FTDNA went from build 36 to 37, match thresholds changed, 23andMe introduced a new user interface (which I find much less intuitive) and GedMatch has made significant changes. The net-net of this is when you decide to undertake this project, commit to it and do it, start to finish. Doing this little by little makes you vulnerable to changes that may make your data incompatible midstream – and you may not even realize it. This entire process is intensively manual. My spreadsheet is over 5500 rows long. I won’t be doing it again…although I will update my spreadsheet with new matches from time to time. The hard work is already done. This same technique applies to any minority ancestry, not just Native, although that’s what I’ve been hunting for and one of the most common inquiries I receive. I am hopeful that in the not too distant future many of these steps and processes will be automated by the group of bright developers that contribute to GedMatch or via other tools like DNAGedcom. HINT – HINT!!! I would like to follow this same process to identify the source of my African heritage, but I’m thinking I’ll wait for the tools to become automated. The great irony is that it’s very likely in the same lines as my Native ancestors. What does it take to do this for yourself using the tools we have today, as discussed? If your parents are living, the best gift you can give yourself is to test them, now, while you still can. My mother has been gone for several years, but her DNA archived at Family Tree DNA was still viable. This is not always the case. I was fortunate. Her DNA is one of the best gifts she gave me. Not just by inheritance, but by having hers tested. I thank her every single day, for both! I could not have written this article without her DNA results. The gift that keeps on giving. You can also test your own siblings as well to obtain more information that you can use to match up to your family lines. Remember, you only receive half of your parents DNA, and your siblings will received some DNA from your parents that you didn’t. I don’t have any other siblings to test, but I have tested cousins from several lines which have proven invaluable when trying to discern the sources of certain segments. For example, one of these Native segments fell on a common segment with my cousin Joy. Therefore, I know it’s from the Campbell line, and because I have the Campbell paternal Y-DNA which is European, I know immediately the Native admixture would have had to be from a wife. Much of this puzzle is deductive, but we now have the tools, albeit manual, to do this type of work that was previously impossible. I am somewhat disappointed that I can’t pinpoint the exact family lines, yet, but hopefully as more people test and more matches provide genealogical information, this will improve. If you want to play in this arena, you need to test at either Family Tree DNA, 23andMe, or both. Right now, the most cost effective way to achieve this is to purchase a $99 kit from 23andMe, test there, then download your results from 23andMe and upload them to Family Tree DNA for $99. That way, you are fishing in both pools. Be aware that less than half of the people who test at either company download results to GedMatch, so your primary match locations are with the testing companies. GedMatch is auxiliary, but critical for this analysis. And the newest tool, DNAGedcom is a Godsend. Also note that transferring your result to Family Tree DNA is NOT the same thing as actually testing there. Why does this matter? If you want a future test at Family Tree DNA, who is the premiere genetic genealogy testing company, offering the most variety and “deepest” commercial tests, they archive your DNA for 25 years, but if you transfer results, they don’t have your DNA to archive, so no future products can be ordered. All I can say is thank Heavens Mom’s DNA was there. Ancestry.com doesn’t provide any tools such as the chromosome browser or even the basic information of matching segments. All you get is a little leaf that says you’re related, but the questions of which segment or how are not answerable today at Ancestry and as CeCe’s experience proved, its unreliable. It’s possible that you share the same surnames and ancestor, but your genetic connection is not through that family line. Without tools, there is no way to tell. Ancestry released raw data files a few weeks ago and very recently, GedMatch has implemented the ability to upload them so that Ancestry participants can now utilize the additional tools at GedMatch. Although this has been an extraordinarily long and detailed process, I can’t tell you how happy I am to have developed this new technique to add to my toolbox. My Native and African ancestors have been most elusive. There are no records, they didn’t write and probably didn’t even speak English, certainly not initially. The only clues to their existence, prior to DNA, were scant references and family lore. The only prayer of actually identifying them is though these small segments of our DNA – yep – down in the weeds. Are there false starts perhaps, and challenges and maybe a few snakes down there? Yes, for sure, but so is the DNA of your ancestors. Happy gardening and rooting around in the weeds. 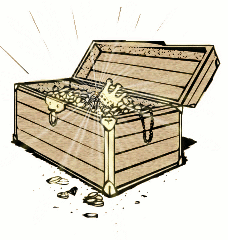 Just think of it as searching for the very best buried treasure! It’s down there, just waiting to be found. Keep digging! I hope you’ve enjoyed this series and that it leads you to your own personal genealogical treasure trove! 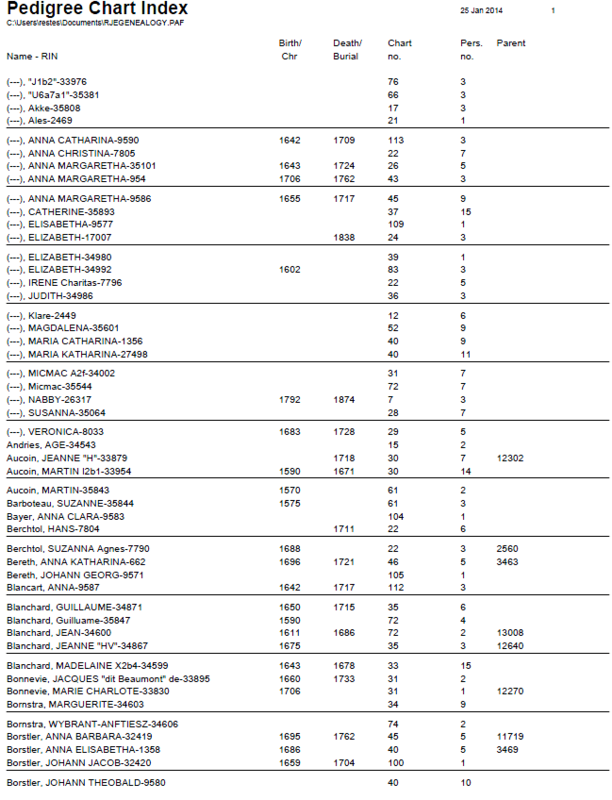 2012 has been a very busy year for genetic genealogists. There have been lots of discoveries and announcements that affect everyone, now and in the future. The watchwords for 2012 would be “churn” and “explosive growth.” Let’s take a look at the 10 most important events, why they are important and what they mean for the future of genetic genealogy. These items are in what I think are relatively good order, ranked by their importance, although I had a very difficult time deciding between number 1 and 2. At the Family Tree DNA conference in November, Michael Hammer, Bonnie Schrack and Thomas Krahn announced that they had made a monumental discovery in the age of modern man known as Y-line Adam. The discovery of Haplogroup A00 pushes the “birth” of mankind back from about 140,000 years ago to an amazing 338,000 years ago. Utterly amazing. The DNA came from an American family from South Carolina. This discovery highlights the importance of citizen science. Bonnie is a haplogroup administrator who recognized the potential importance of one of her participants’ DNA. Thomas Krahn of course is with Family Tree DNA and ran the WTY test, and Michael Hammer is at the University of Arizona. So you have the perfect blend here of participant, citizen scientist, commercial lab and academia. What was never thought possible a decade or so ago is not only working, it’s working well and changing the face of both science and humanity. Geno 2.0 is the Nickname for the National Geographic Society’s Genographic Project version 2.0. That mouthful is why it has a nickname. This amazing project has leveraged the results of the past 7 years of research from the original Genographic project into a new groundbreaking product. Geno 2.0, utilizing the GenoChip, a sequencing chip created specifically for Nat Geo, offers the most complete Y tree in the world today, expanding the SNP tree from just over 800 SNPs to over 12,000. They are in essence redrawing the Y chromosome tree as I write this. In addition, the person who purchases Geno 2.0 will receive a mitochondrial DNA haplogroup assignment. Over 3300 new mitochondrial mutations were discovered. A brand new anthropological “percentages of ethnicity” report is featured based on over 75,000 Ancestry Informative Markers, many only recently discovered by the Genographic project. Additionally, participants will receive their percentage of both Neanderthal and Denisovan ancestry based on 30,000 SNPs identified that signal interbreeding between the hominids. A new website will also facilitate social networking and uploading information to Family Tree DNA. The wonderful news is that there is a massive amount of new information here that will change the landscape of genetic genealogy. The difficulty is that we are struggling a bit under the load of that massive amount of information that is just beginning to descend upon us. It’s a great problem to have! In July, Family Tree DNA implemented the RSRS that in effect reconstructs the genetic profile of Mitochondrial Eve and bases the comparison of our DNA today against the RSRS sequence as opposed to the Cambridge Reference Sequence (rCRS) created in 1981 that is or was the current standard. The RSRS is a result of the watershed paper published in April 2012 by Dr. Doron Behar and 8 other authors titled “A “Copernican” Reassessment of the Human Mitochondrial DNA Tree from its Root.” A complementary research website, www.mtdnacommunity.org, accompanies the paper. 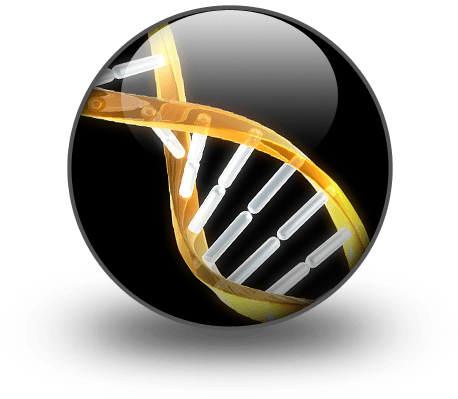 It was announced at the November DNA conference that Gene by Gene, the parent company of Family Tree DNA, through their division titled DNA DTC is offering full genomic sequencing for the amazing price of $5495 for the full genome and $695 for the exome. This is a first in the consumer marketspace. Today, this doesn’t have a lot of application for genetic genealogy, but as the price continues to drop, and utilities are built to process the full genomic data, certainly a market and applications will emerge. This is an important step forward in the industry with a product that still cost 3 million dollars in 2007. It’s official – they did it. Yep, they interbred and well, they are not them anymore, they are us. Given that everyone in Asia and Europe carries a part of them, but not people from Africa, it would appear that two populations admixed rather thoroughly in Eurasia and/or the populations were small. The amount of Neanderthal and Denisovan DNA will continue at approximately the proportions seen today in Europe (2% Neanderthal) and Asia unless a significant amount of admixture from a population (Africa) that does not carry this admixture is introduced. So if you’re European, you carry both Neanderthal and Denisovan DNA. They are your ancestors. The good news is that you can find how much of each through the Geno 2.0 test. 23andMe results give you the percentage of Neanderthal, but not Denisovan. 2012 has been the year of autosomal testing price reductions and a great deal of churn in this marketspace. Companies are playing leap-frog with one another. However, sometimes things are not all that they seem. Initially, 23andMe opted for an initial payment plus monthly subscription model, which they abandoned for a one time payment price of $299 in early 2012. Family Tree DNA was slightly less, at $289. Ancestry led the price war by giving away kits, then selling them for $99, then $129 plus a subscription as an entrance into this market. However, looking at the Ancestry consent form hints at possible reasons why they were selling below the cost of the tests. You are in essence giving them permission to sell your DNA and associated information. In addition, to gain full access to your results and matches, you must maintain some level of subscription to Ancestry.com, increasing the total effective price. Next came Family Tree DNA’s sale where they dropped their autosomal price to $199, but they were shortly upstaged by 23andMe whose price has now dropped to $99 permanently, apparently, a result of a 50 million dollar investment in order to reach 1 million customers. They currently have about 180,000. 23andMe has always been in the medical/health business, so their clients have always understood what they were consenting to and for. Not to be outdone, Family Tree DNA introduced the ability earlier in 2012 to upload your data files from 23andMe to FamilyTree DNA for $89, far less than a second test, which allows you to fish in a second pond where genealogists live for matches. The challenge at 23andMe is that most of their clients test for the health traits and either don’t answer inquiries or match requests, or know little about their genealogy if they do. At Family Tree DNA, matches don’t have to answer and allow a match, testers are automatically matched with all participants who take the Family Finder test (or upload their 23andMe results) and testers are provided with their matches’ e-mail address. Of course, Geno 2.0 was also introduced in the midst of this, in July, for $199 with the additional lollipop of new SNPS, lots of them, that others simply don’t have access to yet. The good news is that consumers have benefitted from this leapfrogging, I think. Let’s hope that the subsidized tests at Ancestry and 23andMe don’t serve long term to water down the demand to the point where unsubsidized companies (who don’t selling participants genetic results to others) have problems remaining viable. Personally, I’ve tested at all of these companies. I’ll be evaluating the results shortly in detail on my blog at www.dna-explained.com. The tools provided by most testing companies, plus GedMatch, and multiple ponds to fish in are allowing the serious genetic genealogist to “reconstruct” their genome, attributing segments to specific ancestors. Conversely, we will also be able to “reconstruct” specific ancestral family lines as well by identifying autosomal segments in multiple descendants. This new vision of autosomal genetic genealogy will allow much more accurate ancestral line matching, and ancestor identification in the not-so-distant future. The good news is that the various ethnicity tests (known as BGA or biogeographical ancestry tests) that provide participants with their percentages of various world populations are improving. The bad news is that there is currently one bad apple in the card with very misleading percentages – and that is Ancestry.com. 23andMe introduced a new version of their ethnicity product in December, expanding from only 3 geographic categories to several. The Geno 2.0 test results are just beginning to be returned which include ethnicity predictions and references to several base populations. Family Tree DNA finally has some competition in this arena where for years they have been the only serious player, although opinions differ widely about which of these three organizations results are the most accurate. All four are Illumina chip based, using hundreds of thousands of locations, as compared with the previous CODIS type tests which used between 15 and 300 markers and are now outdated. All companies use different reference populations which, of course, provide somewhat different results to participants. All companies, except Ancestry, have documented and shared their reference population information. Outside of these companies, Doug McDonald offers a private analysis and Gedmatch offers a series of BGA comparisons written by third parties. PBS sponsored a wonderful series in the spring of 2012 hosted by Henry Louis “Skip” Gates, the chair of African American Studies at Harvard. This series followed a lesser known 2010 series. The 2012 inspirational series reached tens of thousands of people and increased awareness of genetic genealogy as well as sparked an interest in genealogy itself, especially for mixed race and African American people. I was disappointed that the series did not pursue the Native American results unexpectedly obtained for one participant. It seemed like a missed opportunity. Series like this bring DNA testing for genealogy into the mainstream, making it less “strange” and frightening and more desirable for the average person. These stories were both inspirational and heartwarming. I hope we can look forward to similar programs in the future. CeCe Moore covered this series in March and April on her blog. GeneTree, a for profit company and Sorenson, a non-profit company were both purchased by Ancestry.com. This was about the same time as Ancestry introduced their autosomal AncestryDNA product. Speculation was that the autosomal results at Sorenson might be the foundation for the new autosomal test comparisons, although there has been no subsequent evidence of this. Ancestry initially gave away several thousand kits in order to build their data base, then sold thousands more for $99 before raising the price to what appears to be a normalized price of $129 plus an annual ancestry subscription. While GeneTree was never a major player in the DNA testing marketspace, Sorenson Molecular Genealogical Foundation played an important role for many years as a nonprofit research institute. There was significant distress in the genetic genealogy community related to the DNA contributed to Sorenson for research being absorbed by Ancestry as a “for profit” company. Ancestry is maintaining the www.smgf.org website, but no additional results will be added. Sorenson has been entirely shuttered. Many of the Sorenson/GeneTree employees appear to have moved over to Ancestry. The initial AncestryDNA autosomal product offering is poor, lacks tools and the ethnicity portion has significant issues. It’s strength is that many people who test are already Ancestry subscribers and have attached their trees. So you can’t see how you connect genetically to your matches (lack of tools), but you can see the trees, if they are attached and not marked as private, of those with whom you match. Ancestry provides “hints” relative to matching individuals or surnames. Eventually, if Ancestry improves its products, provides tools and releases the raw data to consumers, this may be a good thing. It’s an important event in 2012 because of the massive size of Ancestry, but the product is mediocre at best. Ancestry seems unwilling to acknowledge issues unless their feet are held to the fire publicly as illustrated with a “lab error” erroneous match for an adoptee caught by the consuming public and ignored by Ancestry until CeCe Moore exposed them in her blog. Whether Ancestry ultimately helps or hurts the genetic genealogy industry is a story yet to be told. 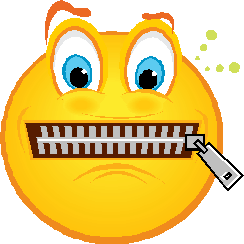 There is very little positive press in the genetic genealogy community surrounding the Ancestry product, but with their captive audience, they are clearly going to be a player. GedMatch, www.gedmatch.com, created by John Olson and Curtis Rogers, isn’t new in 2012, but it’s maturing into a tool that is becoming the defacto workhorse of the serious autosomal community. People who test at either 23andMe or Family Tree DNA download their raw results and other match information and then use a variety of tools at GedMatch to look at results in different ways and using different thresholds. GedMatch is currently working to accept the newly arriving Geno 2.0 data files. Ancestry does not at this time allow their customers access to their raw data files, so there is nothing to upload. The bad news is that not everyone downloads/uploads their information. Only the most savvy users, and the download/upload is not always a smooth process, often necessitating several attempts, a magic wand and some fairy dust for luck. GedMatch is a volunteer effort funded by donations on the GedMatch site. The magnitude of this project came to light when they needed new servers this year because the amount of traffic disabled their internet service provider. It may be a volunteer effort, but it has mainstream requirements. Therefore, while occasionally frustrating, it’s easy to understand why it’s light on documentation and one has to poke around a bit to figure things out. I would actually prefer that they make it a subscription site, clean up the bugs, add the documentation and take it to the next level. It would also be very nice if they could arrange something with the major players in terms of a seamless data transfer for clients. All told, it’s an amazing contribution as a volunteer site. Hats off to Curtis and John for their ongoing contribution to genetic genealogists!!! So, the random tree is firmly attached to me. Now the question is how to remove the parasite. First of all, I need to determine if I really do want the tree attached, meaning it is a tree I might want to reference, or if I simply want to detach it. For DNA project administrators, most of the time, you simply want to detach them from your own personal records. However, if you want to retain the connection to the tree, you can simply disable the notifications. Those constant notifications are the part that will make you crazy, and the more trees you have attached, the crazier the notifications will make you. Disabling notifications is relatively straightforward. You need to go to your name in the top right of your screen and in the drop-down menu select “My Alerts”. You can then change the delivery notification for each tree you have access to. The options are off, daily and weekly. Yes, it’s a pain to have to do this to disable something you never wanted in the first place, but it’s only once (per tree) and it removes the bombardment of unwanted e-mails. Discovering how to remove the trees is more tricky. However, once you’ve figured out how to do this, it’s relatively easy. Fly your cursor over the Family Trees tab. Some have a “More” option. If so, click on it. Mine didn’t. If not, then click on the olive Family Trees Tab itself, not the drop down options. You’ll then see “My Trees” and “Trees shared with me.” Click on Trees Shared with me. There is it, the blessed “remove from list” button. Click and they are gone. This is a frustrating dilemma because genealogists do want to share their information but it shouldn’t become a burden to either party. It’s too bad Ancestry doesn’t give you the option to “save the link” or simply, by default, just look. Thanks to Ann Turner, Debbie Kennett and Jim Owston for their assistance with figuring out how to get rid of these self-attaching trees. Once you know how to do this, it’s not difficult, but figuring out the procedure was anything but straightforward. Sometimes when you’ve done something, like genealogy, for a very long time, it’s hard to remember what it was like as a beginner. Add to that computers, and the age of the “typical” Baby Boomer genealogist being someplace near retirement, and the frustration rises. One of our blog subscribers, Robert, expressed some frustration a few days ago with the fact that so few people upload GEDCOMS and asked for direction to obtain software to create a GEDCOM file. For those who don’t know, GEDCOM is short for Genealogical Data Communication and the GEDCOM file is the universal standard for passing around genealogy files. At Family Tree DNA and at Ancestry, you can upload a GEDCOM file from your Genealogy software to enhance your DNA experience. Without some associated genealogy, the autosomal tests are much less useful. 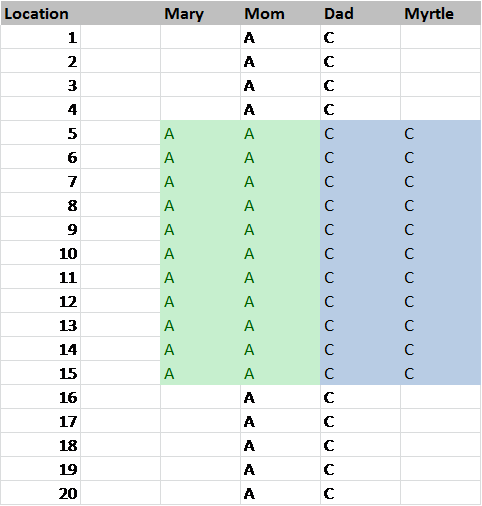 The power of those cousin-identifying tests is in matching family names of others who test. One note about using this product. It has a notes field. I keep everything about this person in this field. It seems to be unlimited in size. These notes can print, or not, on reports. You can see how easy the user interface is, below, and the notes button is the one with the pencil. Very intuitive. In spite of how easy PAF is to use, judging from Robert’s e-mail, it’s easy to get bogged down in the details about the product on the FamilySearch website and discouraged. Good thing he didn’t give up. He was kind enough to send some helpful feedback too, which I’d like to share with you and will make you smile. Maybe we can all break the Curse that Robert speaks of! Today is GEDCOM day. If you haven’t uploaded yours to Family Finder, today is the day! Thanks for directing me to Family Search.org and their Personal Ancestral File. My limited browsing skills struggled for a few minutes trying to find the Personal Ancestral File (PAF) download on the Family Search website. One needs to begin at “Products” under “Resources” at the bottom of the Family Search home page. At some point during my search for PAF, I came across a description of PAF 5.2. It was so loaded with details about the program’s operation and capabilities, that I almost closed the site. Every paragraph left me more confused than the previous one. I finally said to hell with all the user unfriendly details, and then completed whatever actions it took to open PAF 5.2. To my surprise, the chart that I wanted appeared when I clicked on “pedigree” at the top of the page. The format was designed to begin my family tree with me on the left, proceeding to the right with blocks for parents, grandparents, etc. Clicking on each block produced a small window in which one inputs the basics (date and place of birth, death, and marriage, etc.) for each ancestor. Editing was also a breeze. I had been searching for an easy method of preparing just a basic GEDCOM/family tree in an exportable format, without having to purchase a complicated program. Apparently PAF 5.2 is all that is needed to produce one’s basic GEDCOM/family tree which can then be exported to one’s Family Finder website. Maybe you can use this information in your blog to break the digital curse that prevents many of us from preparing and submitting our family tree to our Family Finder website. Seniors are probably the age group most affected by the curse.